I had Friday off from work. While Eric was at pre-school in the morning Kathryn and I took the dogs on a long walk to the old homestead on the top of Pen Bonc Hill. 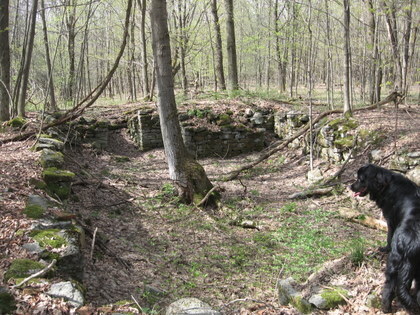 We found the house and barn foundations and the old well. Everything is pretty overgrown as you can see by the size of the poplar tree growing in the old house foundation. The story is that the local family got snow bound during the winter, all their cattle died and they starved out. One of our neighbors says her father could recall the family coming out from the woods at the end of March with all their possessions on their backs and asking which way to Utica. He gave them a ride to the train station in his horse drawn wagon. We are guessing this would have occurred in the 1920’s. 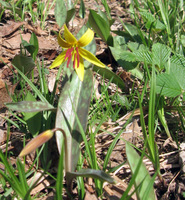 On our hike we saw lots of wildflowers: trout lilies, some little yellow thing and even strawberry blossoms! 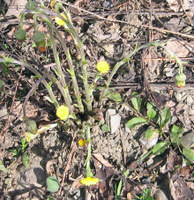 In April! Eric had Trevor over in the afternoon and played while Kathryn and I worked on repairing the trellis under the east deck and stairs. It has been in place for 20+ years and due to snow piles, dogs, and aging it was breaking up. We have yet to complete a couple sections on the south deck. Eric wouldn’t eat supper despite not eating since school, and fell asleep on my lap around 7. We thought he was overtired and got him into bed. Shortly after that he called and Kathryn got to his bed just in time to be completely covered in vomit. We changed the bed, we cleaned Eric up and changed him, we both showered and tried to go to bed ourselves. Eric vomited roughly every 65 minutes until 4 AM. Somewhere around 2am Eric said in a very mature and businesslike way “I think I had better not go to my soccer game tomorrow.” Saturday he was quiet and thirsty but didn’t eat anything until having 1/2 a banana in the evening. Our Soil and Water Conservation District trees came in on Saturday: 50 Blue spruce, 10 white spruce, 10 white lilacs and 10 white birch. I planted the white spruce as replacements for the trees that died out in the pasture. Over the past 3 years I have planted windbreaks totaling about 150 trees – so between the 10 blue spruce from Robert and these 10 white spruce my windbreaks are complete again. I had a row of white pine planted but the deer have nibbled most of those seedlings. The 50 blue spruce went in on our land across the road next to our neighbors dirt road to provide a future screening. The lilacs went on the bank between the house and the road. These were all white lilacs. I have another 10 purple lilacs that I bought with my Christmas gift certificate (thank you Barbara) coming from Miller Nursery. My plan is to have alternating colors. I got everything planted yesterday – except the white birch. They were my impulse purchase and I plan to scatter them around for contrast – a couple across the road and a few near the evergreens. Between our normal weekend laundry, Eric getting sick, getting dirty crawling around under the deck and planting trees we have been doing laundry almost non-stop. Fortunately the weather cooperated and clothes rapidly dried out after being hung outside. We had to drag Eric’s rug outside on the deck and use the rug cleaner (thank you Barbara) to clean it up.